This free DISC personality test lets you determine your DISC type and personality profile quickly. Find out how the DISC factors, Dominance, Influence, Steadiness and Compliance predict your behavior towards others and the everyday things you do. 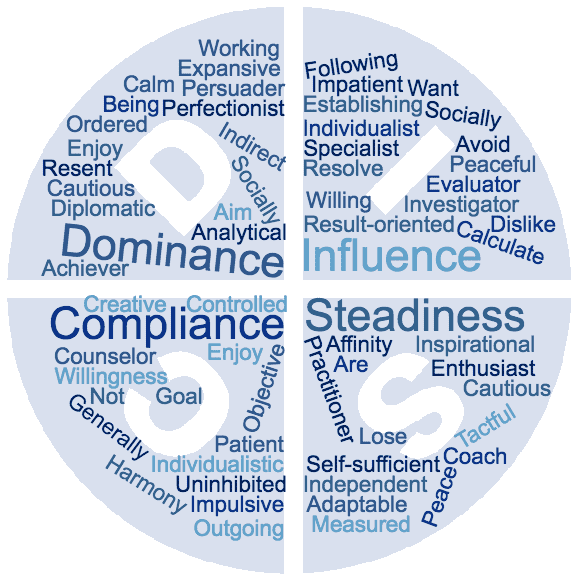 This online DISC assessment is designed to test personality by calculating your personal DISC profile based on your everyday typical behavior. Simply fill out the inventory like you would with other online personality tests. It's quick and without any obligations. The DISC test is, together with the Jung test and Big Five personality test, one of the most well known personality tests worldwide. In the detailed report you will find a graph depicting your DISC type, a concise textual characterization of your personality profile and elaborate explanations of all DISC factors. Additionally you can even upgrade to an extended report if you like. This test contains 28 groups of four statements. Answer honestly and spontaneously. It should take you only 5 to 10 minutes to complete. For each group of four descriptions you should have one most like you and only one least like you. Sometimes it may be difficult to decide which description to select. Remember there are no right or wrong answers in this DISC personality test, so just make the best decision you can.